This article is about the film. For the Japanese animation studio, see Ordet (company). Ordet (Danish pronunciation: [ˈoːˀʁəð], meaning "The Word" and originally released as The Word in English) is a 1955 Danish drama film, directed by Carl Theodor Dreyer. It is based on a play by Kaj Munk, a Danish Lutheran priest, first performed in 1932. The film won the Golden Lion at the 16th Venice International Film Festival, and was the only film by Dreyer to be both a critical and financial success. The film is now regarded by many critics as a masterpiece, admired particularly for its cinematography. 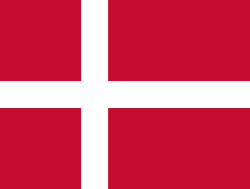 The film centers around the Borgen family in rural Denmark. The devout widower Morten, patriarch of the family, prominent member of the community, and patron of the local parish church, has three sons. Mikkel, the eldest, has no faith, but is happily married to the pious Inger, who is pregnant with their third child. Johannes, who went insane studying Søren Kierkegaard, believes himself to be Jesus Christ and wanders the farm condemning the age's lack of faith, including that of his family and the modern-minded new pastor of the village. The youngest son, Anders, is lovesick for the daughter of the leader of a local Christian religious sect. Anders confesses to Mikkel and Inger that he loves Anne Petersen, the daughter of Peter the Tailor. They agree to convince Morten to assent to the match. Later, Inger attempts to convince Morten to allow Anders to marry Anne. Morten angrily refuses, but changes his mind when he finds out Peter has refused Anders' proposal. Morten and Anders go to meet Peter, in order to negotiate the betrothal. Johannes (Preben Lerdorff Rye) believes that he is Jesus Christ after a mental breakdown. Morten tries to convince Peter to permit the marriage, but he continues to refuse unless Morten and Anders join his sect. As the discussion collapses into sectarian bickering, Morten receives a call announcing that Inger has gone into a difficult labor. Peter says that Inger's difficulties are punishment from God for Morten not joining his sect. Furious at Peter's comments, Morten attacks Peter and storms out with Anders, the two of them rushing home. While the doctor is forced to abort the baby, he is able to save Inger's life. After the doctor and pastor leave, Johannes angers his father by telling him that death is nearby and will take Inger, unless Morten has faith in him. Morten refuses to listen and, as prophesied, Inger dies suddenly. While preparing to go to Inger's funeral, Peter realizes that he has wronged Morten terribly, and reconciles with him over Inger's open coffin, agreeing to permit Anne and Anders to marry. Johannes suddenly interrupts the wake, approaches Inger's coffin, and proclaims that she can be raised from the dead if the family will only have faith and ask God to do so. Inger's daughter takes Johannes' hand and impatiently asks him to raise her mother from the dead. Johannes praises her childlike faith and asks God to raise Inger, who begins to breathe and twitch in her coffin. Seeing what seems to be the miracle of resurrection, both Morten and Peter rejoice, forgetting their religious differences. As Inger sits up, Mikkel embraces her and proclaims that he has finally found faith. After several years of financial problems having stalled his film career, in 1952 Dreyer was awarded a lifelong lease to the Dagmar Bio, an art-house movie theater in Copenhagen. The Danish government had often given such awards to older artists and the profits from the theater allowed Dreyer to begin production on a new film through Palladium Studios. Around that time Palladium president Tage Nielsen received a suggestion for Dreyer's next film from the government run Dansk Kulturfilm, whom Dreyer had worked with before. Kaj Munk's play I Begyndelsen var Ordet (In the Beginning was the Word) was written in 1925 and premiered in Copenhagen in 1932. Dreyer had attended the play's premiere in 1932 and had been writing notes for a film adaptation since 1933. Dansk Kulturfilm suggested that Dreyer finally make the film and be retroactively paid for his years of work on the script. Munk had himself finished a script for a film version, which he unsuccessfully tried to sell to the production company Nordisk Film. In 1943 the Swedish film adaptation The Word was released, directed by Gustaf Molander and starring Victor Sjöström, which couldn't premiere in Denmark until after World War II. For legal reasons the 1943 film forced Palladium to wait until 1954 to begin production on Dreyer's film. Dreyer made changes to the original play such as adding the film's opening scene (which was inspired by a passage from Munk's published memoir), omitting Johannes's previous love affair as having contributed to his mental illness and cutting two-thirds of Munk's original dialogue. Although he was careful to stay true to Munk's intention of the play's message, he cut dialogue down to the bare essentials resulting in a minimalist film. Filming lasted for four months: two months on a studio set and two months in Vedersø, a village in West Jutland where Munk had served as a Lutheran priest. Ordet is best remembered for its cinematography. The film has a total of 114 individual shots, half of which occur in the first and last scenes of the film. Many shots lasted for up to seven minutes. Dreyer used mostly long takes and a slow moving camera, as his style had been gradually progressing towards for several years. He also paid close attention to every minute detail during filming and later said that he "made the film crew equip the kitchen with everything he considered right for a country kitchen. Then...he set about removing the objects. Finally, only ten to fifteen remained, but they were just what were wanted to create the right psychological illusion." Dreyer's shooting method was to shoot one individual shot per day. In the mornings Dreyer would rehearse with the actors while simultaneously blocking their movement, set up lights and block the camera movement. Then at the very end of the day Dreyer would film the single shot, usually shooting between 2 and 3 takes. Dreyer chose not to pre-plan any shots and every decision was made the day of the shoot. Dreyer staged the actors around the lighting design on the set and not to accommodate their performances. Federspiel said that Dreyer never verbally told the actors when he was pleased with their performances and would simply smile when they were performing the way that he wanted them to. The blocking of the actor's movement was so precise and carefully planned out that many them had to count out their steps while speaking their dialogue. Federspiel said that Dreyer personally picked out costumes for every actor and even went shopping for stocking with her. He also hired a linguistic specialist to make sure that all the actors spoke the same dialect as the characters that they played. Dreyer had some difficulty with the elderly actor Henrik Malberg being able to remember his dialogue for such long takes. Munk had written the original role of Morten Borgen specially for Malberg in 1925. Twice in the movie, as Morten and Anders drive to and from their meeting with Peter the Tailor, the pass the rough cross erected at the place where the body of Kaj Munk was found. Munk was assassinated in 1944 during the Nazi occupation of Denmark for openly preaching against collaboration with the Nazi regime. Like her character, Federspiel was really pregnant during the film's production and went into labor towards the end of the shoot. She agreed to allow Dreyer to tape record her labor pains while she was giving birth and then later use the recording as a sound effect in the finished film. While waiting for Federspiel to return to the production after having a child Dreyer and Bendtsen planned out the final resurrection scene. They shot two different versions of the scene, a version from Munk's play which suggests the possibility of Inger just appearing to be dead and a version where the resurrection is a genuine miracle. Dreyer chose to use the second version in the final film. The film premiered on 10 January 1955 at Dagmar Teatret in Copenhagen. It was Dreyer's first film since The Passion of Joan of Arc to immediately receive critical praise and was especially popular in his native Denmark by both critics and audiences, as well as by critics in other countries. It also won the Golden Lion at the 16th Venice International Film Festival. Critic Roger Ebert gave the film a 4/4. He wrote "For the ordinary filmgoer, and I include myself, "Ordet" is a difficult film to enter. But once you're inside, it is impossible to escape." Critic Tom Milne said that "the interior scenes are luminous with a sense of expansive affection arising from the rich, warmly observed detail of the relationship...Throughout the film Dreyer's emphasis is on the density of emotion allied to gesture which he first explored in Master of the House. Critic Robin Wood also praised the film, but said that "our sense of the interdependence of the characters and their actions is communicated visually...one cannot but admire the total essentials, a process that certainly imbues those essentials with expressive intensity. At the same time, I find it difficult not to react against the style as repressive and deadening." Dave Calhoun of Time Out said that "‘Powerful’ doesn’t do justice" to the film and that it "reminds us how in the end we know little about the mysteries of life. Dreyer manages to say all this within the framework of a strange, wondrous and shocking work. Once seen, it’s unlikely to leave you." Peter Bradshaw of The Guardian called it "a gripping and eerie tragedy of the supernatural", but also thought it was not as good as Day of Wrath or The Passion of Joan Of Arc. It has been released on DVD by The Criterion Collection with spine number 126, as part of a box set with the other Dreyer films Day of Wrath and Gertrud. Ordet was entered into the 16th Venice International Film Festival and won its highest prize, the Golden Lion. In 1956 the film was among films honored with the Golden Globe Award for Best Foreign Language Film., as well as the National Board of Review Award for Best Foreign Film in 1957. At the 1955 Bodil Awards it won for Best Actor (Emil Hass Christensen), Best Actress (Birgitte Federspiel), and tied for Best Danish film with Sven Methling's Der kom en dag. It is currently ranked as the third most spiritually significant film of all time by Arts and Faith online community. ↑ Dreyer, Carl Theodor. Four Screenplays. Bloomington & London: Indiana University Press. 1970. ISBN 0-253-12740-8. pp. 239–298. ↑ Milne, Tom. The Cinema of Carl Dreyer. New York: A. S. Barnes & Co.. 1971. SBN 498-07711-X. p. 156. ↑ Wakeman, John. World Film Directors, Volume 2. The H. W. Wilson Company. 1988. 271. ↑ Bordwell, David. The Films of Carl-Theodor Dreyer. Berkely and Los Angeles: University of California Press. 1981. ISBN 0-520-03987-4. p. 224. 1 2 3 4 5 6 7 Bordwell. p. 224. 1 2 3 Wakeman. p. 271. 1 2 3 Ordet DVD Special Features. Birgitte Federspiel interview. The Criterion Collection. 2011. 1 2 Wakeman. p. 272. ↑ Ebert, Roger J. 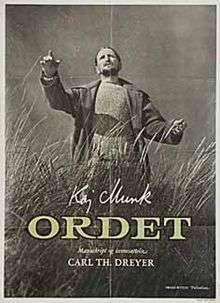 "Ordet Movie Review and Film Summary (1955)." Rev. of Ordet. n.d.: n. pag. Rogerebert. Roger Ebert, 8 Mar. 2008. Web. 20 Nov. 2016. ↑ Calhoun, Dave (March 5, 2012). "Ordet". Time Out. Retrieved June 10, 2014. ↑ Bradshaw, Peter (March 8, 2012). "Ordet-review". The Guardian. Retrieved June 10, 2014. ↑ "Award Winners from 1932 to present". www.carnivaleofvenice.com. Retrieved November 25, 2014. ↑ "The Word". The Hollywood Foreign Press Association. Retrieved November 25, 2014. ↑ "1957 Archive". The National Board of Review. Retrieved November 25, 2014. ↑ "1955". Danske Filmkritikere Bodilpris. Retrieved November 25, 2014. ↑ "The Arts & Faith Top 100 Films (2011)". Center For Religious Humanism. Retrieved November 25, 2014. "The Incarnate Transcendence of Ordet"